There have been numerous gastropubs to open in the last few years. You've seen REAL, Pint + Jigger, Dash, Salt Kitchen & Tasting Bar, and Home Bar. Enter BREW'd. They opened in the latter part of April, and have been bumpin' ever since. In the past two weeks, I've been there twice! This happened not only in part of their loyalty rewards program where you spend $200 and receive $20 off your next purchase, but also because I'm in love with their food. Burrata Salad, Truffled Dungeness Crab Deviled Eggs, and Root Beer Braised Short Ribs with Polenta that together in your mouth, create a melting pot of creamy, tender, savory robustness. And these are just a few of the menu items. Located on 9th Ave in Kaimuki, you can find street parking or park in their small lot in the back. BREW'd has a couple stalls marked for them or a few other spots for the building itself. Happy Hour is from 4-6pm daily and closed on Sundays. Only drink specials for Happy Hour, no food. Some of my faves? Definitely the Short Ribs with Polenta. I'm a big Polenta snob, so wherever I can get creamy, delicious Polenta, I'm ordering it! The Buffalo Wing Candied Bacon is a winner as well- only thing is I wish it came with more than 3 slices! Truffled Dungeness Crab Deviled Eggs were phenomenal. Not your typical boring deviled eggs. The Mac and Cheese and Chicken Club Sliders were also memorable food choices. I would highly recommend the Guinness Gelato for dessert too! A must-have! Beer choice? Heretic Torment. 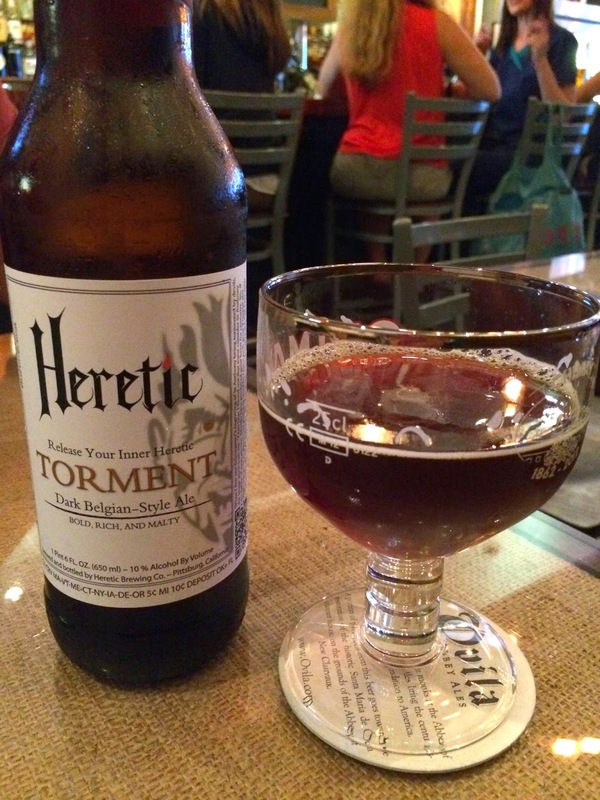 Deliciously dark Belgian-Style Ale with a hint of sweet. My kind. The only thing I wouldn't order again- the Oyster Shooters with Yuzu, Bloody Mary Mix, and Pale Ale. I so wanted these shooters to be amazing, but they turned out to be a watery mix of fishiness. It didn't taste fresh. Very "ocean-y." Otherwise, I'm going to be back soon. There is still a menu list of many other things I'd love to try. Mushroom Ravioli, Cioppino Risotto and Henry Weinhard Root Beer Float, I'm coming for ya! And of course, ending with Guinness Gelato!